Also Called: Butter-and-eggs, wild snapdragon. Stems: Erect or ascending, 1 to several, simple to branched. Leaves: Alternate or nearly opposite below, numerous, crowded, linear, 1 to 2 inches long, 1/12 to 1/4 inch wide, pale green, glabrous, narrowed to a stalk-like base. Inflorescences: Raceme, congested, spike-like, terminal; bracts alternate, reduced. Flowers: Short-stalked, calyx deeply 5-parted; segments lanceolate, nearly equal; corolla .8 to 1.6 inch long including spur, 2-lipped, bright yellow with orange beard on lower lip at throat; upper lip 2-lobed, 1/3 to 1/2 inch long; lower lip 3-lobed, 1/4 to 1/3 inch long; stamens 4. Fruits: Capsule, nearly spherical, 1/5 to 1/3 inch long, 2-celled; seeds numerous, disc-shaped with wings. Habitat: Open disturbed sites, roadsides, waste areas, and rangeland. Origin: Native of Europe and Asia. Introduced as an ornamental in North America in the 1800's and now naturalized. Toxicity: Suspected to be mildly poisonous to livestock. Comments: Strong-scented. Sometimes grown in flower gardens, but can escape and spread aggressively. In rangeland, it can displace desirable grasses. 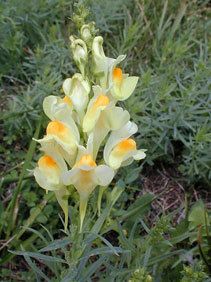 Yellow toadflax is difficult to eradicate, due to its extensive root system.